The postdoc gets back from his Christmas break tomorrow, and I plan to have a revised version of his uptake-bias manuscript waiting for him. I've been working through the last part of the Results, and it's looking pretty good. Not finished of course, as there are still two analyses to add. 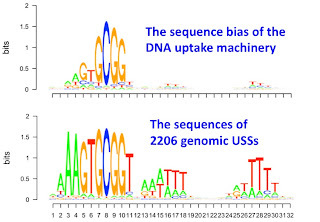 One is the experimental test of the positional interactions predicted by his analysis, comparing uptake of DNA fragments containing single or double mismatches from the consensus USS. I think he's going to do this experiment as soon as he gets back. 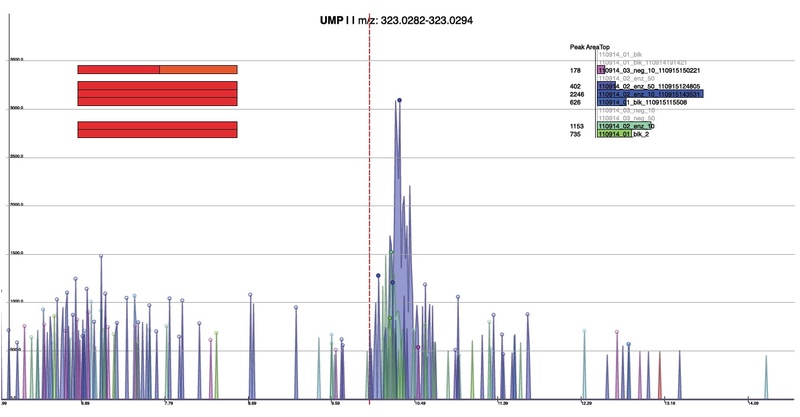 The other is analysis of out-of-alignment uptake sequences in fragments that were taken up despite lacking a good in-alignment uptake sequence. 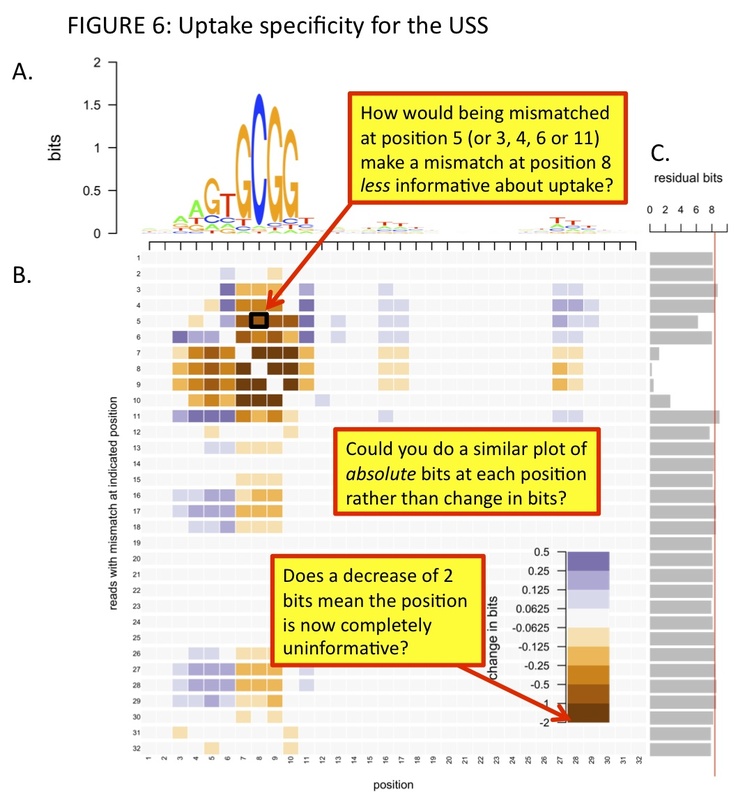 This issue arises because some fragments contained small insertions or deletions that caused their uptake sequence to be misaligned in the original analysis, and some other fragments may have substitutions that created an uptake sequence at a new location in the fragment. There aren't very many of these out-of-alignment uptake sequences but sorting them out helps clarify some other issues. He's already done the analysis (at least most of it) but we still need to incorporate it into the Results. The bigger problem is what to say in the Discussion section. Right now it's a shambles, with lots of interesting points and good sentences and well-written paragraphs all jumbled together. I need to get a better perspective on this - to think about what actually should be discussed. One place to start is the Introduction. Issues we raised there should be addressed and ideally resolved in the Discussion. Unfortunately, our lovely work doesn't really resolve these. Well, so much for working on the Discussion... I'm now back to asking myself (and, in absentia, the postdoc) questions about how we interpret his analysis of interaction effects: Do interaction effects explain the discrepancy between genomic motif and uptake motif? Do interaction effects support the hypothesis that uptake bias is intrinsic to the mechanism of uptake, and not the effect of a single dedicated recognition protein? And more questions I've added to his lovely figure, so I remember to ask him them tomorrow. And now, I've got two manuscript reviews (both overdue) and a book review to do. 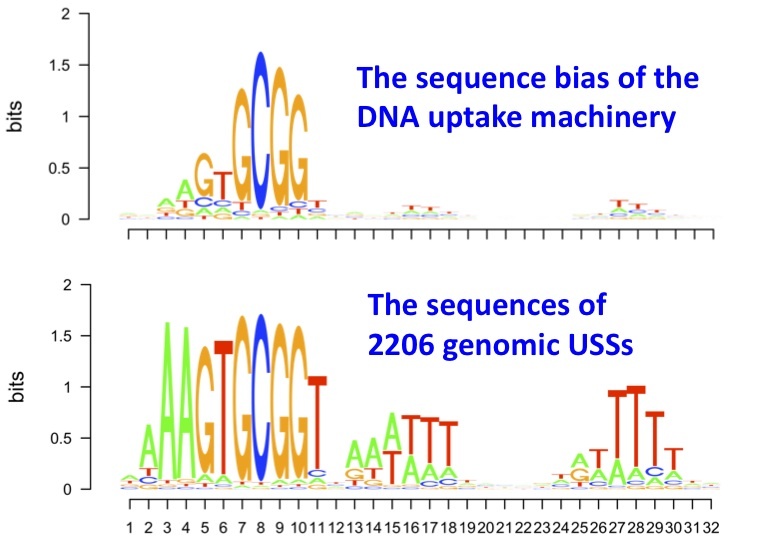 This time it's that we need a more rigorous comparison of the uptake-specificity motif his data has produced with the old 'genomic' motif we derived by analyzing the genome with the Gibbs Motif Sampler. Both motifs consist of numbers representing the probability of finding each of the four bases (A, G, C T) at each position in a 32 bp segment. 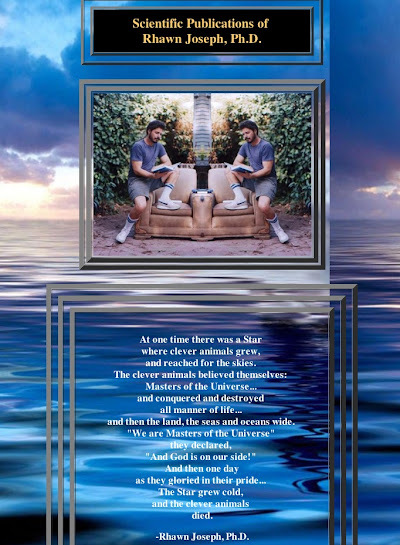 We've been saying and writing that, although these motifs have the same consensus, they are very different in the importances they ascribe to different positions. We have a list of four possible explanations for the differences, but before we discuss these we need to test whether the motifs actually pick out different subsets of the genome. 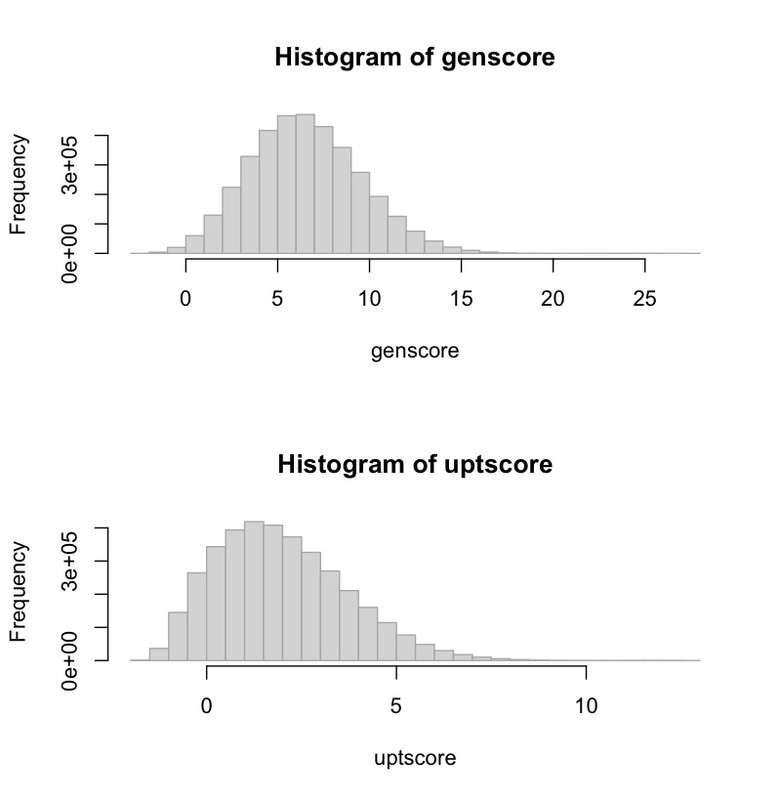 Maybe all of the ~2500 sequences that would be found by searching for the genomic motif would also be found by searching for the less-constraining uptake motif. If so, we might then focus on what other sequences the uptake motif found, or, if it didn't find any, why not. Yesterday I made 8 preps of competent cells, all to further our phenotyping of our new competence-gene mutants. Four of them needed to have transformation assays done, three were to be frozen for later DNA-uptake assays by the postdoc*, and one was a knockout of the competence-regulator sxy, to be used as a negative control in the uptake assays. I didn't include a wild-type positive control strain for my transformation assays, because I've done this lots of times before. But I did assay the sxy mutant, just to confirm that I had the right strain. 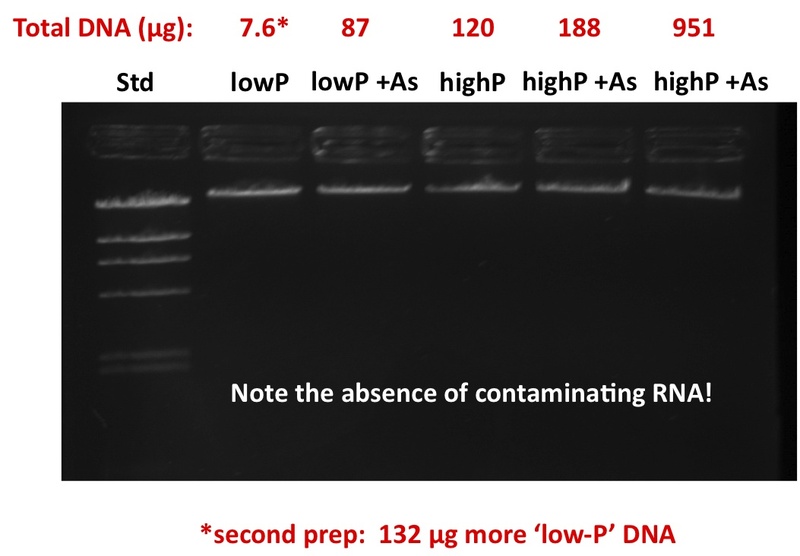 The assay is simple: mix 1 ml of competent cells (~10^9 cells) with 1 µg of NovR chromosomal DNA, incubate for 15 min, add 10 µg DNase I, incubate for 5 min, dilute and plate on plain sBHI agar and on sBHI agar with 2.5 µg novobiocin/ml. Most of the strains I assayed had been tested before, but some with not-very-consistent results, and I was expecting to see a wide range of transformation frequencies (maximum about 5 x 10^-3 and minimum less than 10^-8 (the detection limit)). Because I wasn't sure what I would find, I made a point of plating 100 µl of undiluted culture from each assay. BUT, there were absolutely no NovR colonies on any of the plates. So I'm pretty sure I screwed something up. But what? I used the same DNA stock tube I've used many times before, and I definitely remember putting 3 µl of DNA into each assay tube. I made fresh sBHI + novobiocin plates using pre-made BHI agar,, and I definitely remember adding the hemin (4 ml), NAD (80 µl) and novobiocin (40 µl) to the melted agar before I poured the plates. The DNaseI should be fine; I've used this tube before. And the cells aren't dead, as the plain sBHI plates had the expected numbers of colonies. Oh how I wish I'd included the positive control! Luckily I froze one tube of competent culture of each of the strains I transformed, 'just in case', so I can redo the transformations without having to make now competent preps. To check if I somehow screwed up the agar plates despite my 'definite' memory, I've streaked a test known NovR strain on them, with and without more NAD or hemin. Before I go home I should set up some overnight cultures of the strains I'm going to test tomorrow... Wait, will I have time to do this tomorrow? It takes time and planning to get the cells into the right growth stage for the competence treatment, and then a couple of hours for competence development and the transformation assays. I have a meeting in the middle of the day, and then we're going to finalize the grades for the big genetics course... Yes, sure, I can always work late. * The postdoc is getting interesting results from these assays. First, all of the mutants he's tested, even those lacking genes thought to be essential for DNA uptake bind/take up at least fourfold more DNA than the noncompetent log-phase cells he's using as a negative control. 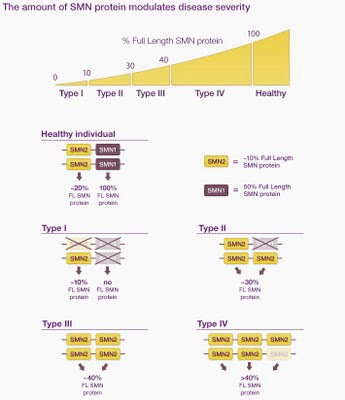 The competent sxy- cells I've just made won't induce any competence genes in this medium, so the amount of DNA they associate with will tell us whether this binding is just a property of cells that have been incubated in the starvation medium, or represents induction of some competence genes. For a couple of the mutants, he's found much higher DNA association levels than we expected. One mutant should lack the secretin pore through which the pseudopilus contacts the DNA; the other lacks PilF2, an 'accessory' pilin that's absolutely required for transformation, presumably because it's absolutely required for DNA uptake. 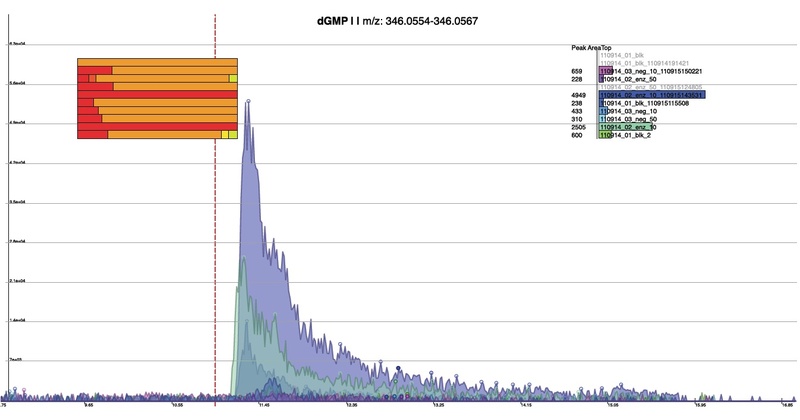 The next step is to repeat the DNA uptake assays, this time comparing treatments with and without DNase I in the wash step. If the mutant cells are binding to DNA but not taking it up, the DNase I should remove the DNA. UPDATE: My novobiocin plates had no NovR colonies because I had forgotten to add the required hemin supplement to the agar! How embarrassing - I haven't made that mistake in years. My collaborators have taken pity on me and sent me some of their control analysis data. This is mass-spectrometry analysis of a control DNA sample I sent several months ago. The GFAJ-1 cells this DNA was purified from were grown in medium without arsenic, so we don't expect to find any arsenic in the DNA. This DNA was just used to test the methods they will use, but it also provides some measure of the purity of the DNA I sent them. That's because this DNA hasn't been put through the CsCl-density-gradient purifications step that they'll use for the new DNA samples I sent a few weeks ago. I'm going to have to put in a bit of work before I have any idea of what I'm looking at. But I'm not complaining - this is exactly the part of science I like best. I've just gotten an update from my collaborators. They're still polishing up their purification methods, and waiting for the mass spectrometer machine-time that will open up when other researchers take time off over Christmas. So with luck we'll have a preliminary answer in a few weeks. Then we'll have to get busy generating the final data and writing our paper! Preface: To test the conclusions of Wolfe-Simon et al., I need to grow GFAJ-1 cells in phosphate-limited AML-60 medium containing 40 mM sodium arsenate. Because the final cell density will be very low (limited by the low phosphate), to get enough pure DNA for the analysis I will need a large volume of culture, probably at least 500 ml. At present the cells grow fine in medium without arsenate, but only occasionally grow in medium with arsenate, and so far only in small volumes. When they do grow in arsenate they grow just as well as in the control cultures without arsenate. So I suspect that there is some uncontrolled variable in my growth conditions that usually prevents growth in arsenate, but I don't know what it is. Do you have frozen or lyophilized stocks made from when you first received the culture? Can you start a new working culture from frozen stocks in case being cultured in the absence of arsenic causes the cells to become sensitive to arsenic? If the cells are not pure culture, some may have plasmids conferring arsenic resistance plasmids. From someone totally uneducated in microbiology, but could the stock be impure and have a very small number of cells which can grow in arsenate? michiel's suggestion would disclose this. Yes, all the ±arsenate cultures I've done were started with tubes of the same frozen stock of GFAJ-1. I grew and froze these cells from a single colony soon after I discovered that adding glutamate to the medium gave good growth. These cells were grown in phosphate-limited medium for several generations before they were frozen, to deplete intracellular stocks of phosphorus. Have you checked whether the bacteria in arsenate cultures are still viable? Wash away the arsenate move them to the a rich medium and see what happens.If the revive growth might just have stunted. I've done this sometimes - plating the cells from arsenic cultures that failed to grow onto agar-solidified medium with no arsenate. Usually there are still some viable cells, but knowing this doesn't help me understand why the cells usually don't grow. As unhappy as the cells are in arsenate, could the arsenic itself been screwing with their motility in some fashion? That's the only explanation that comes to mind re: mixed v. still cultures. 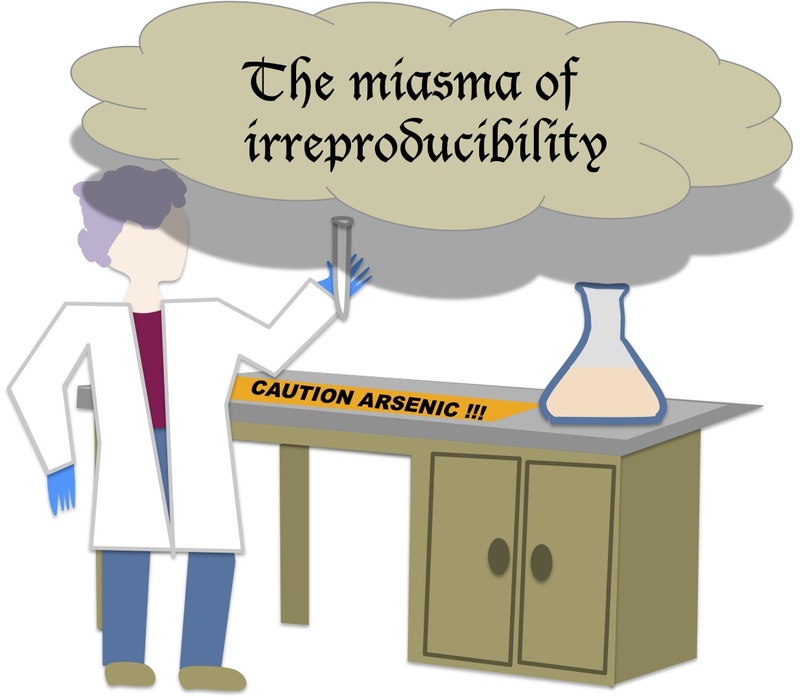 Yes, it's conceivable that the cells in glass tubes failed to grow in the latest experiment because (i) the arsenate inhibited their usual motility and (2) they weren't being mixed. But non-motile cells usually grow to fairly high densities in stationary cultures - it just takes them a bit longer because access to nutrients is slowed by the need to rely on diffusion rather than active mixing. Maybe I'm violating a sacred boundary with this suggestion, but I would love to hear Felisa Wolfe-Simon's thoughts on this. She must have done something differently (her error bars in Fig. 1 are tiny! ), and we're all tearing our hair out trying to figure out what it is. Have you considered just asking her? Is she too busy to try to help? As a scientist, I'm thrilled when I see that someone has reproduced my results, especially in a different lab. Wouldn't she also want to see this? I'd be delighted to get advice from Dr. Wolfe-Simon. But given my previous criticism I don't feel right about approaching her. She certainly must know what I'm doing, so if she doesn't comment I assume it's because she chooses not to. The cells have likely mutated, erasing any former capacity for growing in an arsenic-laced environment. But sometimes cells inoculated from the same frozen stock have grown just fine. One time I even took cells that had grown up in 40 mM arsenate and transfered them into medium that another inoculum had failed to grow in. These arsenate-resistant cells did not grow in the new medium. This suggests that the problem is with the medium, not the cells. Of course it's always possible that I made a mistake in preparing the medium, but I've been very meticulous, especially lately as I became increasingly concerned about reproducibility. Is it possible for arsenate to interact with any of the components in the medium? The reason I ask: My experience with trace metal toxicity is that any time we opened a brand new ingredient container we had to test a whole panel of metal concentrations using the new ingredient(s). This is b/c the trace metals would complex with the various organic compounds in the medium ingredients. Since we had to use complex/undefined ingredients (such as casamino acids or yeast extract), the only way to guarantee that consistent bioavailability (and toxicity) of the trace metals would be to use the exact same ingredient containers. Same old container, very reproducible results. New container, new toxicity profile. So if you haven't done so already, try talking to a geochemist about whether there could be anything in your medium that could be interacting with the arsenate, either chemically or physically. This might explain why some batches of arsenate medium are more toxic than others. If that line of inquiry doesn't pan out, then my next guess would be genetic instability of some type for the arsenate tolerance phenotype. I've been using the same chemical stocks throughout. I only have one bottle of 1 M sodium arsenate. Some of the earlier experiments used medium made with an earlier batch of the '4x AML-60 salts', but all the recent ones have used the same batch. I only have a single batch of the 500x vitamins mix and the 1000x trace elements mix - both are stored frozen and thawed and mixed when needed. With respect to the genetic instability issue, see above comment about the failure of arsenate-grown cells to grow in medium prepared on a different day. Do you have a chemostat? It might be interesting to get them going in continuous culture, and then slowly crank up the arsenic. If the problem is that they've adapted away from arsenic tolerance, that would be one way of trying to get them back on the wagon. When they are able to tolerate enough arsenate to satisfy you that they are adapted, resequence them. 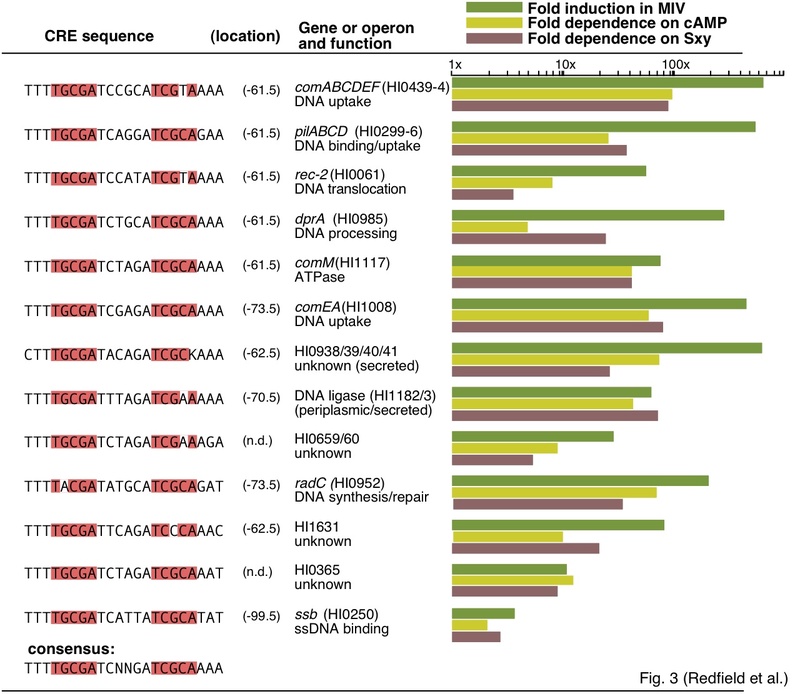 If GFAJ-1 ever was arsenate-tolerant, you should see at least some similarities among the lab-adapted adapted strains and the environmental samples supposedly living in arsenate. If not, I think we'll all have to notch up the skepticism another couple of pegs. @Alexa: Wolfe-Simon was "evicted" from her previous lab after all the chaos, so I guess she might very well have lots of free time to give advices..
Actually I think Rosie should hire her. This would give a really positive message about science and women in science. She'd be welcome. I don't have money to pay her, but I understand that she still has her NASA fellowship. Presumably (based on your earlier results) -As should be able to keep growing normally without any problems...maybe at 15mM cells will start to die for magical reasons that can eventually be figured out. I did an experiment with plastic and glass tubes a while back. 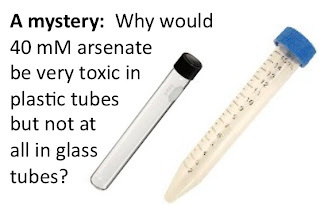 The cells in glass tubes grew fine in 10 mM arsenate and 40 mM arsenate, but the cells in plastic tubes didn't grow at all. Our students at CSUSB presented this paper in Journal club, and we had, shall we say, a lively discussion :). One thing that struck me in reading the published back and forth in Science was the proposal that GFAJ-1 uses the high-affinity P transport system induced by arsenate. This was dismissed by FWS out of hand because in her mind it would lead to higher arsenate toxicity (I think that is what she was saying, I am not an expert on this). But it seems to me that if GFAJ-1 has a robust detox mechanism (reduction and sequestration or some such) it could induce the high affinity uptake and still handle the influx of arsenate. Further, it seems like the enrichment strategy they used would select for variants of exactly this type. This variant might be very unstable because expressing high levels of the detox mechanism would be a competitive disadvantage in the absence of As. The analogy that makes sense to me is something like a drug efflux pump. Several other commenters have already suggested methods to deal with this (going back to original stocks, using chemostat culture or serial increase in As) but the more i think about it the more this seems like the simplest explanation, and a testable one at that. Thanks for doing these experiments, this is really a nice way to show students and the public what science should and can be. Have you finally added tungsten to the media? 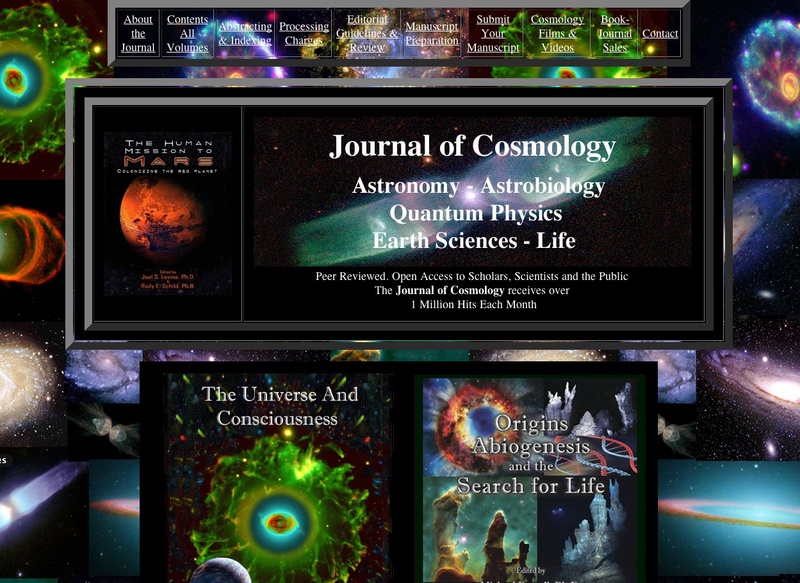 Maybe tungsten is necessary for the high affinity P transport system induced by arsenate that Paul Orwin discussed above. Yes, I added the tungsten to the trace elements stock well before I began trying to get the cells to grow in arsenate. How about you throw the towel in and stop wasting your own time/money trying to make sense of FWS' bunk science. The paper should never have been published and in these times of tough funding you shouldn't be wasting your time trying to replicate her crappy work! It's true that, from a strictly scientific viewpoint, there never was any justification for trying to replicate these results. But strong 'sentiments' were expressed several places that someone should try anyway. 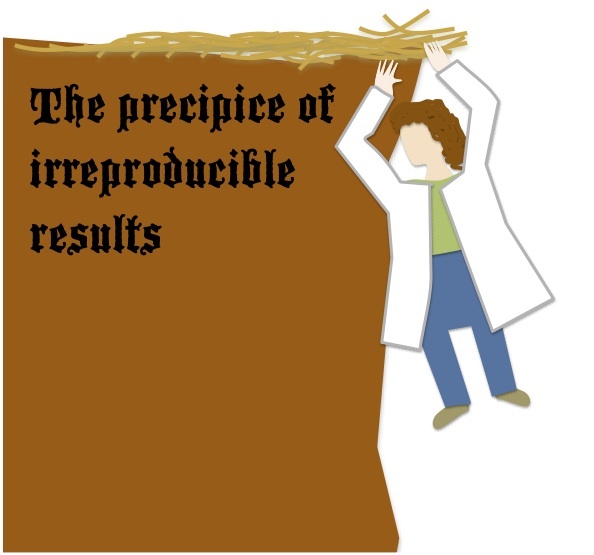 If I can't get reproducible growth I won't proceed - I wouldn't trust my results and I wouldn't expect anyone else to. @Anonymous, 7:57 PM: The question is, at what point can everyone agree that Rosie has sufficiently demonstrated the "bunkness" of FWS' work? I didn't believe the growth curves even back in December, but what about the people who were willing to give them the benefit of the doubt? These people still exist--you can find them in the comments section of the PopSci article. And what about the authors of the paper, who apparently don't take seriously anything that isn't published in a peer-reviewed journal? I am also stumped as to how Rosie should proceed (at this point, would a journal publish her results? ), but at least she is doing something to try to mitigate the rampant confusion and misunderstanding regarding this whole story! @alexa, I agree that Rosie should be commended for trying to make sense of the mess that is the FWS paper, but how far will this go? Seems like even the most basic of experiments (growing a culture) cannot be replicated reliably. 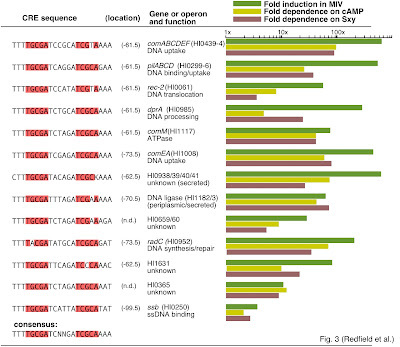 And people are suggesting sequencing of all the different "strains" of GFAJ-1? Setting up a turbidostat? Funding is tough right now and the cost/burden of replicating/repeating this work ought to be on Oremland and FWS. It still blows my mind that Bruce Alberts hasn't done anything. If Oremland is a respected scientist he ought to try repeating (with better experimental design i.e. gel purifying DNA, MS/MS of the "As-DNA", etc) and retract the paper if they cannot replicate. Hats off to you for trying Rosie, but I hope your real research doesn't suffer from this distraction, although I must admit its been entertaining! I disagree strongly with the notion that Rosie should give up (although it's obviously her choice and not mine). Although I think FWS and colleagues misinterpreted their data, I don't think it was fraud, I think they found an interesting bug that they were able to enrich from Mono Lake and coax into growing under high As/low P conditions. The mechanism of that is interesting! I think that the As for P in DNA is incorrect, but that doesnt mean the whole thing is worthless. As an aside, I think any working scientist has to spend a lot of time thinking about practical concerns like getting your next paper published or grant funded, so side projects like this are obviously on a "shorter leash". And why would you think Bruce Alberts or Norm Oremland would want to do this? Finally, of course people in a blog comment section are going to suggest over-the-top solutions (it's alot easier to tell someone else to do something than do it yourself). But maybe someone will have a really great idea! You never know - if you have an idea, suggest it. PS- growing a culture is not always "simple", and this set of experiments is good evidence for that. No growth in 40 mM arsenate in ANY container! The containers with the blue '-' labels have no arsenate, those with the orange '+' labels have 40 mM arsenate. This is ridiculous. I don't think I've ever had such blatantly non-reproducible results before. All I can think of to do next is to once again test growing cultures in glass screw-capped tubes, in medium with and without arsenate. But even if the cells grow with arsenate in this next test, I won't have any idea why, or why they didn't in this experiment. And anyway this experiment clearly says the problem isn't the containers. That last experiment was motivated more by wishful thinking that by having actually discovered why my GFAJ-1 cells grow inconsistently in arsenate. Result: cells in foil-covered glass flasks grew fine without arsenate, not at all with it. Now I need to put on my serious-science hat and do a test of multiple factors. 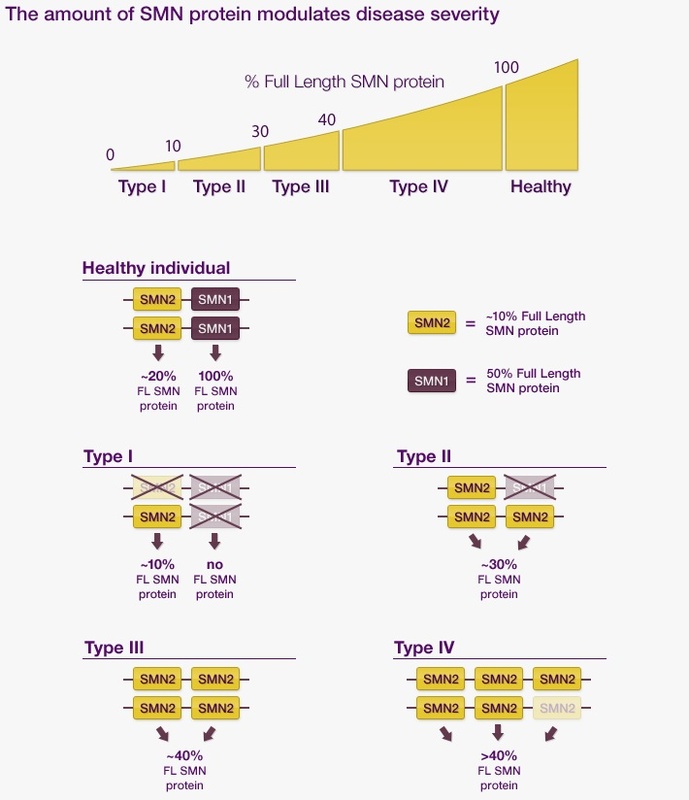 Plan: Prepare large volumes of two parallel mixtures of GFAJ-1 in AML60 medium, one with 40 mM arsenate and one without. Then place replicates in many different culture conditions. Plastic screw-cap tubes. Glass screw-cap tubes. Loosely capped glass tubes. Loosely capped plastic tubes. Tiny tubes. Big tubes. Foil-covered plastic flasks. Foil-covered glass flasks. Screw-capped glass bottles. Screw-capped plastic bottles. Large volumes of liquid with little air space. Small volumes of liquid with lots of air space. Stationary. Gently rocking. Shaken, not stirred. Vigorously agitated. The last few weeks I've been in teaching-zombie mode, with my brains sucked dry by 350 second-year genetics students. But I've only 4 more classes to go (each taught twice) and this morning I went into the lab and cleaned up all the glassware from the last three or four experiments. Now I'm ready to start a new one. This is a very unambitious experiment, the next tiny step in solving the "Why won't GFAJ-1 grow consistently in 40 mM arsenate?" problem. In previous experiments the cells grew well with arsenate in small glass screw-cap tubes (now soaking in preparation for future re-use), but my DNA preps will need much larger volumes (500 ml or more), because cells can't grow to high density when phosphate is limiting (duh). So now I'm going to try growing them in glass flasks with and without 40 mM arsenate. I'll grow them on the communal shaker in the 30 °C room rather than in our spare shaker since our shaker is needed for other experiments. So: 250 ml glass flasks (I have 6 sterile and ready to use), with 20 ml of AML60 medium with glucose, glutamate, and added phosphate at 0, 3 µM and 1500 µM, with and without 40 mM sodium arsenate. All inoculated with phosphate-limited GFAJ-1 cells from my freezer stock, at about 10^4 cfu/ml. My institution has a new fundraising campaign. UBC generates ideas that start evolutions. Ideas that change the way people think and the way the world works. We see this change as an evolution, one that improves upon what has come before and inspires the generations that follow. So much for scientific literacy in the Development Office. 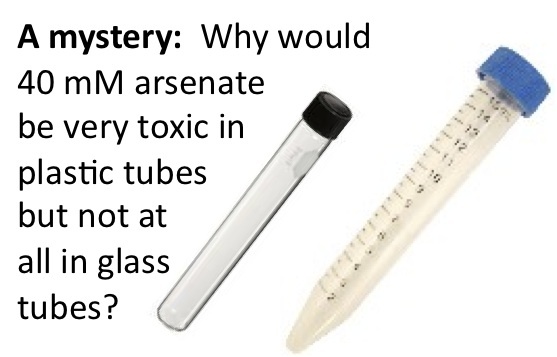 Commenters on my latest post suggest that the glass tubes might be somehow sequestering the arsenate. I've been assuming that the surface area of the glass is much too small to bind up all the arsenate in a 40 mM solution, but maybe I should do a calculation to check this. First, how many arsenate ions would it take to completely coat the inner surface of one of the glass tubes I'm using? The tubes are about 10 cm long, with an inner circumference of about 2 cm, so that's about 20 cm^2 of glass surface. This paper says that the ionic radius of arsenate ions is 0.248 nm, so I'll assume a diameter of 0.5 nm. If the ions were to pack squarely side-by-side onto the glass surface, there would be about 2x10^3 per µm, or about 2 x 10^6 per mm. That's about 4 x 10^12 per mm^2, or 4x10^14 per cm^2. So if the inner surface of a glass tube were densely coated with a monolayer of arsenate ions, it would sequester about 8x10^15 ions. Next, how many arsenate ions are in 5 ml of a 40 mM solution? 6x10^23 ions/mole times 0.04 moles/liter times 0.005 liter = 1.2x10^20 ions. So less than 0.01% of the arsenate ions in my medium could be tightly packed in a monolayer on the inner surface of a glass tubes. The assumption of dense packing is very conservative, so I don't think sequestration of arsenate by the glass can be the explanation for the GFAJ-1 growth I'm seeing. But thank you to the commenters for prompting me to do the calculation. The design of this experiment is described in the previous post. 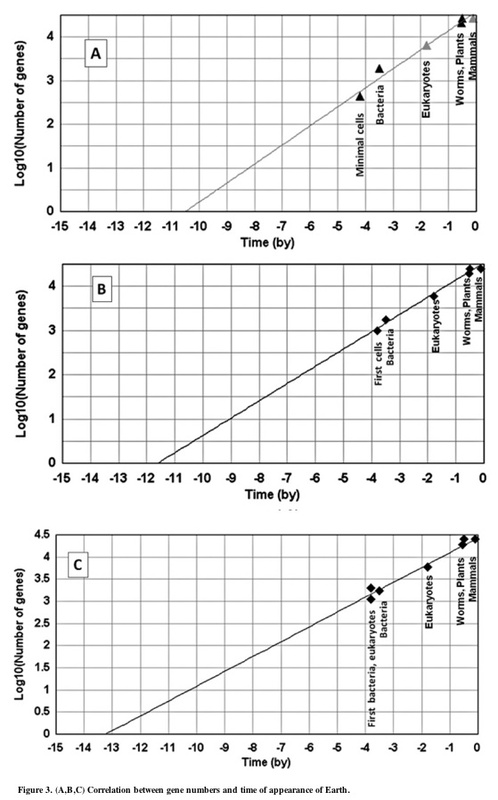 The upper graph shows that, in the absence of arsenic, growth is phosphate-limited and nicely reproducible. 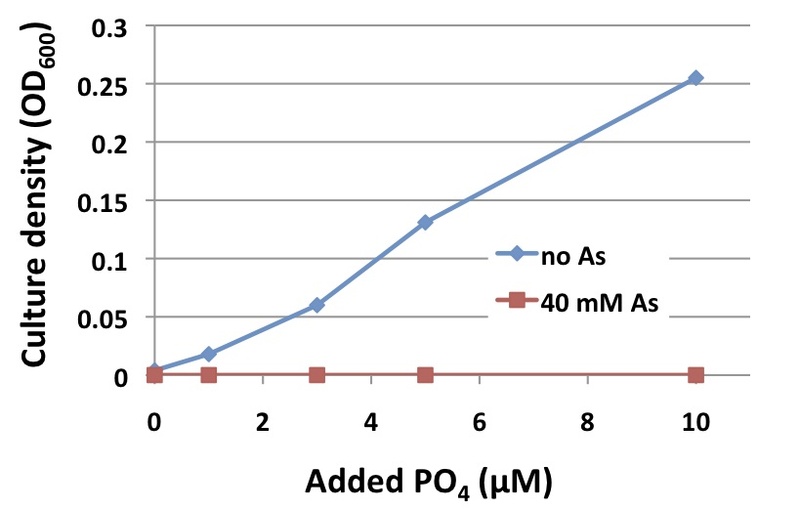 The red lines are replicate cultures with no added phosphate (two in glass screw-capped tubes, one in plastic (square symbols) ); the blue lines are replicates with 3 µM phosphate added (three in glass, one in plastic) and the purple ones are replicates with 1500 µM phosphate added (two in glass, one in plastic). 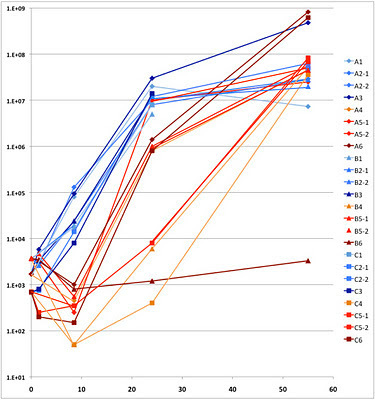 The lower graph shows that growth is much less reproducible in the presence of 40 mM sodium arsenate. The blue, red and purple lines are the same phosphate treatments as in the left panel; again square symbols indicate cultures in plastic rather than glass tubes. The most striking result is, as seen before, that cultures in the plastic tubes (the three lowest lines) grew very little, even with abundant phosphate. 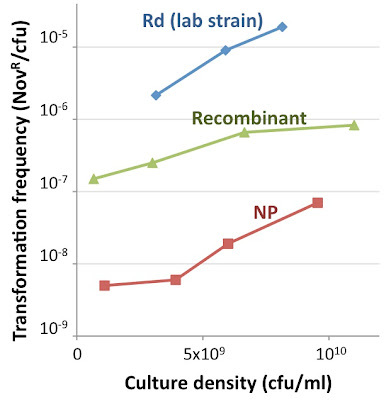 The two no-added-phosphate cultures in glass tubes (red) grew identically and slightly better than their no-arsenate controls, as did two of the three 3 µM phosphate cultures (blue). 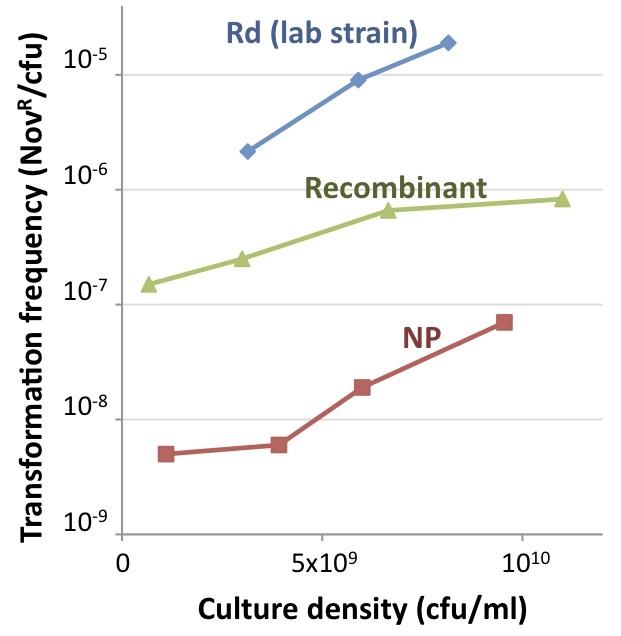 The third 3 µM phosphate culture grew to only half the density of the others. The two 1500 µM phosphate cultures (purple) grew to high density, one slower than the other. 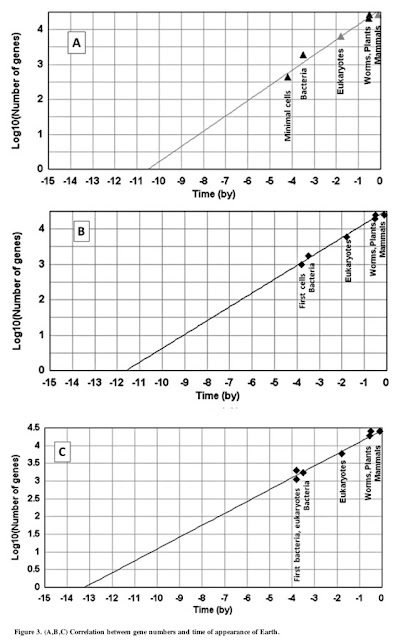 The growth differences between replicates are unlikely to be due to differences in inoculum size, since all cultures began with 10^5 cells/ml. I have no idea why growth in polypropylene tubes makes cells arsenic-sensitive. Googling 'arsenate' plus 'polypropylene' didn't suggest anything. Maybe now I'll try cultures in glass flasks. Regular readers will know that my attempts to grow GFAJ-1 in medium with 40 mM arsenate have given very inconsistent results (Expts. 1-3, Expts. 1-4, Expt. 5, Expt. 6). 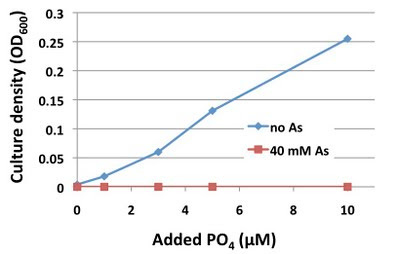 The Wolfe-Simon et al paper reported that these cells were resistant to 40 mM arsenate, but in my experiments so far the only time the cells really appeared to be resistant to 40 mM arsenate was Expt. 5, when I grew them in screw-capped glass tubes. 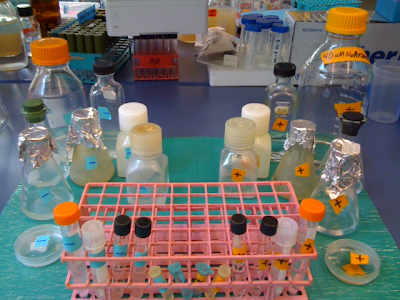 Even if I set aside all the other experiments (in foil-capped flasks or in screw-capped plastic tubes), this experiment was compromised by tube-to-tube inconsistencies in final cell density, probably due to the presence of some limiting nutrient (perhaps not phospate) contaminating some of the tubes. So I've now acid-washed all the glass tubes and caps, rinsed them lavishly in distilled water, and re-autoclaved them, so I can see if this experiment's result is reproducible. These conditions are closest to those used by Wolfe-Simon et al., so if I can consistently get growth in 40 mM arsenate I can prepare DNA from arsenate-grown and control cultures for mass-spectrometry analysis. I'm going to streamline the number of conditions (just ± 40 mM arsenate, combined with no added phosphate, 3 µM phosphate or 1500 µM phosphate) and do two replicates in glass tubes and one in plastic tubes. I'll make up 50 ml of no-phosphate medium, add cells (from my frozen stock of phosphate-depleted GFAJ-1) to about 10^4 cfu/ml, and split this in two. I'll add arsenate to one half (and water to the other). Then I'll put 5 ml into each no-phosphate tube, add phosphate to 3 µM to the rest (both parts), and put 5 ml into each 3 µM PO4 tube (using 3 replicate glass tubes). Then I'll add more phosphate to the rest, to 1500 µM, and put 5 ml into each 1500 µM tube. Then I'll put all the cells gently rocking in the 28 °C incubator. I had expected to spend the first half of September frantically polishing our latest resubmission of our grant proposal on DNA uptake by Haemophilus influenzae. But I missed a pre-registration deadline, and the Canadian Institutes for Health Research (CIHR) offers no recourse. Applicants are supposed to register their pending proposals a month in advance, including a one-page summary of the proposal and suggestions for the appropriate review panel. In the past I've always done this at the same time I signed up to have a draft of the proposal go through the internal review process my university offers. But this time around I didn't think it needed another round of internal review - the writing and presentation is already very good, and the only weakness the reviewers found was in the proposed experiments. So I didn't sign up for internal review, and didn't remember the pre-registration step (due August 15) until earlier this week, when I went online to start working on revisions to the budget. I've now spoken to our Research Services office, to a CIHR administration, to a local colleague with lots of CIHR administration expertise,a nd to a distant colleague who made the same mistake for a previous deadline. All agree that there's no recourse - I'll have to wait until the March 1 2012 deadline. 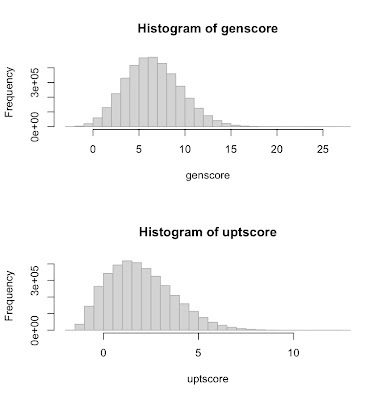 Well, this gives us plenty of time to generate the new preliminary data that will address the reviewer's request that we use point-mutation mutagenesis to analyze the functions of competence genes. This is good in that growth in the absence of arsenate is cleanly limited by the amount of phosphate the medium contains. A parallel culture with 1500 µM phosphate reached an OD of 0.63. But the cells in medium with 40 mM arsenate don't appear to have grown at all. 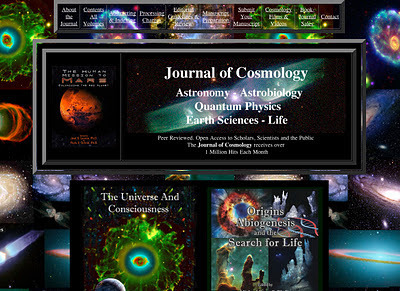 I'm away for the rest of the week (Science Online London! ), so I put the tubes back into the incubator, to see if the arsenate cultures just grow v-e-r-y s-l-o-w-l-y. Two weeks later: No, the arsenate cultures didn't grow at all.